It's one of the scariest trends to attempt, but once you get a handle on print mixing, it can change your life. Think about it â€” when you can start creating combos that you've never tried before, your potential wardrobe combinations and permutations increase exponentially, you can get dressed faster, and you'll impress your fashion friends (seemingly) effortlessly. It's a skill that takes some sharpening, but we've got an easy-to-follow primer of match-ups that make sense together, involving prints that you should already own. 2. Animal On Animal — Wearing two types of animal prints together might get you mistaken for an Atlantic City casino veteran, but the secret to making it look modern is to wear one in a realistic print and the other in a more artful, graphic iteration. 3. Thick Stripes And Nubby Tweeds — Yes, textures count, too! This nubby, patterned tweed skirt was begging for some lightness, which came in the form of a sheer, striped top that mirrored the tuxedo stripe on the skirt. How's that for some harmony? 4. Tartan and squares. You might think this would look redundant, yet it does not! Ad some color contrast for a stylish impact. 5. 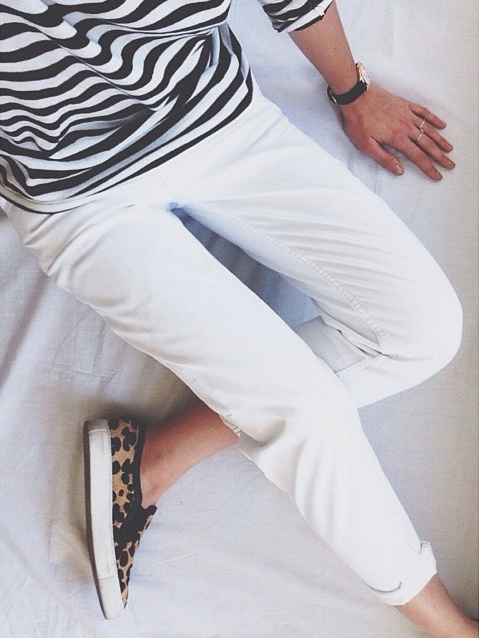 Leopard and stripes. Already common, you should be able to put together this mix extremely easy, cause a stripes-top and a leopard-something should exist in any wardrobe! Let's call it lace day. And let's see some cool ideas of how to wear lace through the day.